Category Archives for "FAMILY TENT REVIEWS BY SIZE"
8-person family tents are one of the most popular choices a family makes when it comes to choosing the best family camping tent for their camping trip. We have chosen some of the top rated 8-person family tents to review for you based on brand, the most popular, the highest-quality, affordability, and weather protection. 8-person tents are generally a more suitable size for a camping party of five to six people, so no one feels cramped, and there is plenty of room for everyone’s gear and space to move around. An 8-person camping tent usually has interior areas that are divided to generate individual rooms. The room divider makes assigning sleeping places for couples or sets of friends easier to do on your camping trip. In addition, it can separate the particular adult bedroom area from the children’s region which allows for more privacy and space for everyone. Numerous 8-person tents are log cabin tents (you can visit our Instant Cabin Tent review) and are often two room tents. If you want more in the way of separate rooms, then you may find that there are very few options and you might have better luck if you take a look at some of our ten person tent reviews. An 8-person tent allows enough room for campers to utilize comfortable accommodations such as air mattresses in the space for a better night sleep. Note: In case of you need a higher-quality 8- person tent for a glamping trip, you can read our luxury camping tent reviews of Kodiak Canvas Flex-bow Deluxe 8 Person Tent, or Big Agnes Flying Diamond 4 6 8 Person Tent. Why Should I Purchase an 8-Person Tent? If you are planning on taking a long trip with a group of people, then you probably already know how important it is to have a good-sized tent. Having one larger tent is also more feasible than having to purchase and tote around several smaller tents. Doing so may also mean more in fees at the camping site to accommodate the extra tents. 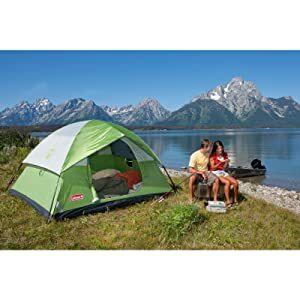 Read the 2019 CHEAP / ON SALE reviews for all types of tents NOW!!! (4.5 / 5)The rating based on our researches. The Coleman 8-Person Red Canyon Tent tends to be one of the leading brand names with regard to extra-large tents that offer simple setup and take down. This Crimson Canyon Tent is not excluded from this. This tent is high on the list because of its water-resistant construction, affordable price, and ease of use. It is actually easy for one person to set up this tent by themselves and the instructions come attached to the inside of the bag close to the zipper, as they always are with Coleman tents. What makes this camping tent very easy to set up is the color-coded poles that utilize reddish and gray stickers which makes it easy to understand where each pole is supposed to go. It takes the guesswork out of setting up the tent. Overall, the surface and interior of this tent are made to be sophisticated but still earthy and rugged. All in all, this is the Best family tent among consumers since it delivers on its promises. Owning this tent can be an investment for families who love the outdoors and love to camp and want something close to the convenience and comfort of home. This tent also features weather protection just in case you find yourself camping in less than ideal conditions for part of your trip. 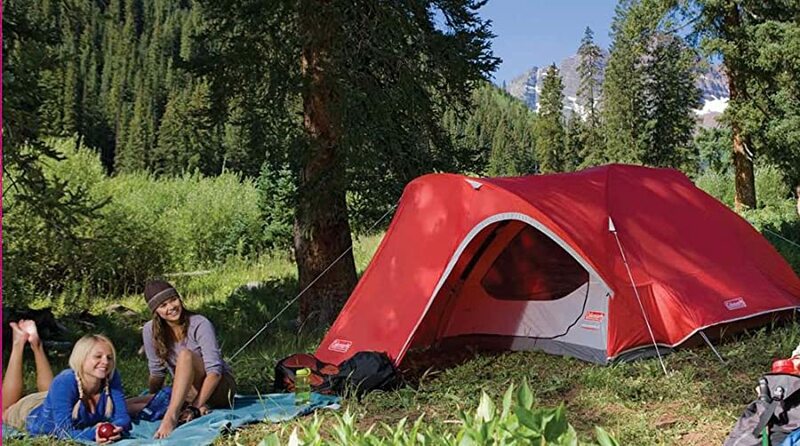 The Coleman 8-Person Red Canyon Tent is one of the most affordable tents in the marketplace right now. You can purchase this tent at a more than reasonable price point of within $100 and $300. Coleman is among the leading manufacturers of outdoor products and gear that are designed to assist you on all of your adventurous outings. This 8-person quick tent measures 14 feet x 10 feet and may be the perfect answer for a larger family that loves to camp but don’t want to sacrifice space and comfort. This particular tent performs just like a champ in numerous different climates, plus it is incredibly easy to set up. Once the tent has made its way out of the bag, you simply invert the bend from the corners of the exterior frame so that the rods extend out plus down instead of down and up. Then you simply lengthen the four extending poles that expand from the biggest point of the tent to the four corners and then snap them into position after they reach their maximum extension easily. Overall, it is a fantastic family tent choice that is also designed to withstand sun and rain and is engineered to last. Just like other Coleman tents, the 14×10-foot Coleman 8-Person Instant Tent has been manufactured with Weather Tec technology to withstand serious weather conditions. This advanced and innovative technology includes veneered polyester materials as well as webbing and zippers that provide improved protection against heavy rainfall. It also features powerful pole-seams and a water-resistant foundation making the tent virtually flood proof as well. The anchors provide the tent with even more stability, so it can stand strong against even the most high-powered winds. Additionally, this tent can be set up quickly and easily in just minutes without any headache or hassle. It allows you more time to spend with the family on your camping trip. 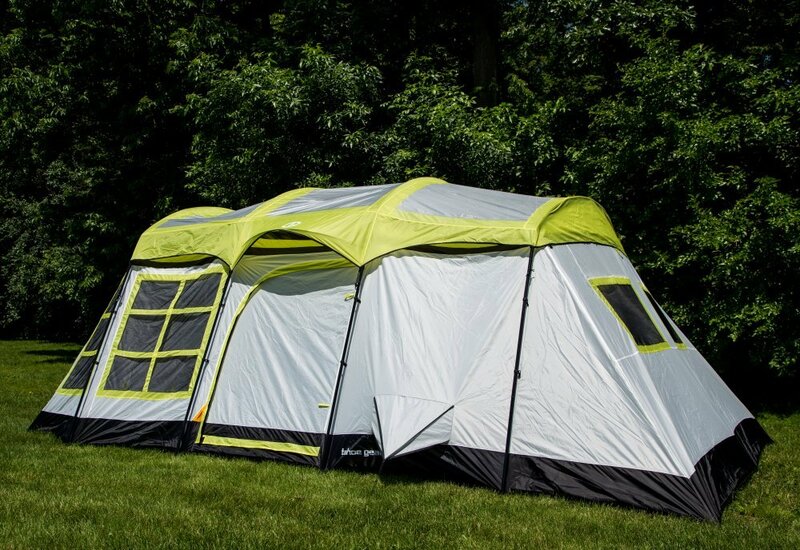 The Coleman Montana 8 Tent feels more like a house than just a shelter at the campsite due to its cabin tent-like design plus a lot of spacious rooms. The 16-foot x7 foot floor size is generous, and assembly is easy. The shock-corded fiberglass poles proceed to utilize color-coded clips and sleeves for the better of two systems which allow for simple and straightforward assembly. The waterproof instructions are usually sewn to the handbag for the convenience. The broad hinged door is also simple and easy to utilize. Great air flow is supplied by a few windows and a fine mesh ceiling. The durable poly floor and the taped fly stitches help keep water outside where it belongs, rather than allow it to seep into the tent. The included porch stretches beyond the entrance way to provide you with a dry and clean spot to leave your sneakers or even to simply sit down and unwind with friends and family after a fun day of hiking or fishing. The Montana 8 is also lightweight and is probably among the most affordable big family tent options currently available in the marketplace. The Wenzel Klondike is a great family base camp tent that has actually been around for several years. This particular tent features a full mesh roof, detachable fly, and an attached display room. 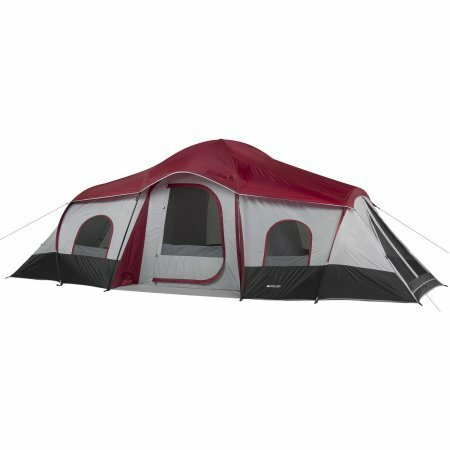 With a lot of space and room to operate inside, a grouped family of 4-6 people could have an enjoyable experience in this two-room tent. The screen space in the front has a ground cover, and this area may be used as a bug-free eating area, a sunroom, storage room, or even as another bedroom if needed. The panels can be conveniently zip-closed for privacy. Big windows provide additional air circulation, improved ventilation, and great views. The enormous screened-in porch area also increases square footage and space once the windows are closed. The trunk wall of the household cabin dome camping tent includes a lower zippered vent which allows more airflow closer to the floor. This feature keeps you cooler on those warmer summer nights. Finally, this tent is one of the most comfortable tents in the marketplace right now. It can comfortably accommodate eight people. This tent is very easy to set up, and it can be set up within only 20 minutes. It is sturdy and durable as well as highly weather resistant. In spite of its big size, it is still pretty lightweight and easily portable when it is collapsed. The Wenzel Klondike 8 Person Family Tent is a great choice for your family and will offer you comfort with all the space you need to accommodate your entire family. 8-person tents are the best option for those that love to camp with their bigger family. These tents offer ample space to comfortably sleep several people while also allowing enough room to store everyone’s gear. They typically also come with the option of a room divider so that the space can be divided up and used appropriately while also allowing for a bit more privacy while in the tent. Ridge tents tend to be remarkably sturdy and range from small one-person tents right up to big marquees. Today they are trouble-free to pitch and make excellent shelters. The main disadvantage of this type of large family tent is in head height – even the biggest units of this tent type can experience limited height. A ridge tent is designed so that the roof slopes down from a central ridgepole and this sloping is what limits the available space within the tent. A Three Season tent is made to keep you cozy and dry while camping in all weather conditions. These tents are designed to handle high winds. The walls of these tents are typically made from a variety of mesh materials plus other solid components to provide a balance between protection and proper ventilation. Three season tents are not suitable to be used during the Winter months because they cannot adequately withstand snowy conditions. This kind of camping tent is for campers that prefer to dabble in a variety of different climates. Convertible tents feature hybrid designed function poles, a vestibule, and also include rain fly options so that the tent can be adjusted to suit whatever kind of weather conditions you are going to experience on your camping trip. These tents are incredibly versatile, but you will find that they are much heavier than other tent types. However, they are a very durable option. Nowadays you’ll see a lot of flexible pole tents in the marketplace. The essential shape bends a versatile pole right into a half circle and is then fixed to a solid tape or webbing band that runs across the foundation of the tent and is also usually part of the groundsheet as well. Two flexible poles crossing in a square by the middle dome and three rods are in a hexagon shape. The sides tend to be more vertical, so overall, you will find more headroom toward the center of a dome tent than you will find at the sides. Stability will be great in smaller versions but, unlike the particular ridge tent, domes will get less stable as they scale upward in size. Instant tents, or a pop-up tent, are usually produced by a number of different manufacturers and are the latest within a variety of tents that basically assemble on their own. An extended, coiled, jumped frame is completely fitted into the material of the tent. Simply by twisting the framework, the tent gets a circular package. They require minimal work in the way of setup and take down. It is a quick and straightforward process. Unleash the springtime – in some instances throw the tent into the air, and the sprung framework turns the material bag into an amazingly elegant and useful shelter. The color of this tent may become a little bit faded if it is kept in the sun for a long time. Moreover, it is very excellent as a family camping tent. The flexible rod hasn’t carried out aside with the original rigid frame tents. They are very popular among the campers. They work with a rigid framework associated with right poles (usually metal) along with angled joints and may still offer plenty of space including great headroom, plus stability when erected. On the downside, framework tents are usually heavier and take somewhat more time to assemble than other tents. There should be space and height for a man can stand and walk easily. The Best 8-person family tent is big and spacious when it is assembled but is also compact when they are folded up making them easy to transport and store. They are usually lightweight and easy to carry together with your other camping components. These tents are constructed with a sturdy polyester material. The mesh material which functions as the ventilator is made from opaque materials, and the frames are really strong because of the fiberglass and metal elements. Family tents are approximately 20 feet broad and can accommodate 4 or 5 people comfortably. Bigger models can accommodate even more people. Tents should be the ideal sanctuary for children or pets wherever you might be including popular locales such as the beach, a resort, recreation area, or a friend’s home. They should offer a nice reprieve from the hot sun and any other less than ideal weather conditions. A zippered door with cover-up and three windows provide circulation and visibility. The kids’ play tent works equally as nice as a furry friend shelter when traveling or camping out. It can provide some much-needed isolation as well as a cushy and comfortable spot to rest. The 8-person tent has been carefully designed to sleep around eight people comfortably. The interior design is very attractive and convenient as well. The enormous size offers a sufficient area of two rooms. It has used a 190T polyester material to generate the flysheet and provide the tent with the ability to protect you and your family from the elements. The same may also be said for the durable PE 1500mm water-resistant base. Sleeping pods have been installed along with a mosquito mesh to safeguard you from bugs. You can also find some extra comfort and convenience with the inclusion of storage pockets along with a lantern hook for all those late nights. Family tents usually accommodate from 4 to 12 individuals. They’re meant to be utilized by groups that will need to experience every part of this outdoor exercise together. Because of their dimension, family tents generally offer more comfort and ease than smaller tents but tend to be harder to store and transport. However, the maximum eight individual tents are usually easier to transport and also typically come with an easier assembly process. Weather and seasons are always a vital issue to consider when you are going to be camping in tents. This is especially true if you will be camping during the wetter seasons of the year. The ground curves a few inches in the tent’s wall to avoid leaks during wet climate. To enhance this particular effect, you should make certain that the rain fly overlaps the floor’s perimeters by quite a few inches. This will go further to help ensure that no moisture will enter the tent, so you and your group can stay warm and dry even in the wettest weather conditions. The most common materials found in tents are usually nylon or polyester for the canopy and vinyl, nylon, or even polyethylene for the ground. Choice of material is essential when using tents on more challenging terrain or even in specific climates. When choosing an 8-person tent, you will want to try to stick to brand name manufacturers that you know provide consumers with a reliable and high-quality product. You don’t want to waste your money on an inferior product that won’t be able to withstand your many family camping trips. Stick the bigger name companies and always do your research and read reviews before choosing the best eight-person tent for your family. Floor Area: With regard to floor space, be certain to check the actual sizes and not just the square footage. Depending on your stature and needs, you may require more headroom or more floor space. Headroom: A lot of people overlook this; however, the available headroom will be dictated by the walls slope. Consider the number of individuals that will be using the tent coupled with the type of weather you may encounter. If you’re likely to be trapped within the tent for an extended amount of time due to inclement weather, then you’re likely to want some ample headroom, because you will be inside a lot and may want to be able to stand upright while inside the tent. Shape: You should also always consider the form and overall design and shape of your tent. A high-roofed rectangular styled tent will offer you more dried out storage space and a secure place to prepare when it’s turbulent and rainy outdoors. Ceiling Loops: These are ideal for dangling lanterns, so you have some light inside of the tent at night. Metallic Pole Junctures: They are called hubs and allow for more sturdiness and also permit poles of various lengths to join with each other. These junctures also help cut the weight and draw the canopy outward to generate vertical walls to provide you with more livable space. Internal Pockets: These are ideal for storing small products within the tent so smaller items do not get lost and they are within easy reach. Guylines: These offer extra balance throughout rain, wind, and even snowfall. You attach them to the guy-out loops that can be found on the edge of the tent and on the rain fly. It’s far better to use reflective cords to avoid tripping on the guylines at night time. Question: The set-up instructions for my tent have been lost. Can I get brand new ones? Answer:Yes, definitely. Call the customer satisfaction department with the tent design name, and they can deliver a photocopy of the tents instructions. Question: Is it easier and better to roll a camping tent for a backpacking journey? Answer:By rolling, you are essentially getting the tent to be much smaller and more manageable so that it can be easily placed into the storage bag. A rolled tent may also be easier to set up. However, folding and rolling a tent can crease it in exactly the same place each time and this can cause some serious damage to the waterproof coating of the tent. Stuffing the tent into the storage bag can also distress and damage the coating of the tent as well. Question: How do polyester tents differ from nylon tents? Answer:Polyester has been proven to be more resistant to ultraviolet abrasion and harm than nylon fabrics. Polyester also offers much better structural integrity — it generally does not stretch out or even sag when damp from rainfall, snowfall or dew, this means the inner tent stays dried out and protected. Question: What will it mean whenever my tent sticks collectively? Answer:Whenever your camping tent begins to stick together it means that the waterproofing on your own tent may be getting old. The organic portions of the protective coating of the tent may be breaking down and causing the stickiness to happen. If this is the case with your tent, you should carefully read and follow the guidelines on how to reapply the water-resistant coating to your camping tent. Question: What are the benefits of rod and clips pockets? Answer:Rod and clips pockets provide added steadiness and stability to a new dome style tent. In addition, ventilation is improved, and the air is able to freely circulate more, because of the open region the clips produce, between your tent fly and wall. Question: Exactly how easy is it to set up an eight man tent? Answer:8-person tents are generally lightweight and easy to set up. Nylon tents weigh about 50 % of exactly what their canvas equivalent weighs, so right from the start, you’re working with a material that is a lot lighter and easier to handle. Shock-corded poles are pre-connected inside a pole section. There is no guessing as to just how many pieces constitute the pole area. The particular self- assisting data compression arch framework that’s formed in establishing the pole areas lends framework plus support during installation. Once the tent is set up, it is also easy to maneuver it around the campsite without having to stake it down for stability. Question: What else could harm the tent? Answer:1. Chemical pollutants can damage your own tent. These ingredients include insect repellents, stove gas, tresses sprays, fruit drinks, plus acid from leaking torch batteries. Make sure all these items stay clear of your tent at all times. Sand or dust may also erode a new zipper and can cause it to be harder to close. If you are using your tent within the sandy soil, clear the zippers by flushing them with fresh drinking water frequently. Question: What is the goal of the rain travel? Answer:The rain travel protects the permeable part of the camping tent. In every nylon tent, the rainfall travel is an integral section of the total tent construction. The water repellant roofing fabric allows warmth and allows any water vapor to go out of the camping tent to help limit and minimize moisture build-up and condensation within the tent. The water-resistant travel (outer layer) offers rainfall protection and also traps condensation. If a large amount of condensation has collected within your fly, I suggest that you take away the fly and also get rid of the dampness. Big tents like 8-person tents are usually made of UV resistant polyester fabric that unfortunately may not be impervious to the damaging ramifications of long-term sun exposure. It is recommended that the seams in the bottom of the windows be sealed using an item such as McNett Seam to avoid dampness from the needle holes. Adhere to the manufacturer’s guidelines when pertaining seam sealer. You should never store your tent while it is damp or wet. Mildew will begin to demolish a tents’ water-resistant covering. Allow your tent to dry out completely then store it in a dry place. Never machine wash your 8-person tent. Doing so may damage the waterproof coating. Instead, hand clean the tent with a moderate soap and rinse with clear water and then allow the tent to dry completely before storing. An extremely dirty camping tent could be set upward and washed just like a car, or it could be washed in a bathtub using your fingers in order to agitate the water. Purchasing a high-quality eight-person family tent for your camping trips is a smart investment and will cost significantly less than it would to buy several smaller tents. They will provide you and your family with plenty of room to move around and will offer a nice retreat from adverse weather or even just a little shade on those hotter summer days. Before purchasing your new eight-person family tent, remember to do your research and read reviews to pinpoint the features you would like to have and determine a realistic budget. Expert says: Hello, I’m Jeremy from Family Tent Center. When you begin to take a closer look at the tent’s capacity, you are looking at the square footage and how many sleeping bags will be able to fit comfortably. A four-person tent is the ideal option for two people because it allows extra room to store gear and you will still have a bit of wiggle room. If you are a family of four and were considering a four-person tent, it may be in your best interests to go a size up and research six-person tent options, so you will have more room to stretch out. Next, you will look at the tent’s features and construction. Fiberglass poles may be easier to break; however, they are lighter in weight. Aluminum poles are also lightweight but may be a bit more durable. A rainfly is also recommended because it acts as the tent’s umbrella and helps keep rain and moisture out. You will want to find a tent with a rainfly that comes all the way down the sides of the tent instead of one that just covers the top of the tent. The rainfly is waterproof, but you may also want to consider a tent that is water-repellant. Folded seams and double stitching will lend to the tent’s longevity, durability, and strength. It will also help eliminate the chance of water leaking into the tent if the weather conditions are less than ideal for your camping trip. Available models: 2 persons, 3 persons, 4 persons. You can set up the Weanas® Waterproof Double Layer 2, 3, 4 Person 3 Season Aluminum Rod Double Skylight Outdoor Camping Tent easily and quickly by one person. The tent door uses a two-way zipper. Both sides can be tightened, and it has a door curtain pull clasp that is more convenient and durable. The tent top has two closeable ventilation skylights. When closing the outer layer, you can use it as a storage room for shoes and backpacks or other gear. This tent has a super classic interior design which makes it extremely convenient and comfortable for all of your nights in the great outdoors. And there is no fear of getting drenched in the rain either – the professional waterproof fabric will take care of it for you. WHAT AMAZON CUSTOMERS SAY ABOUT IT? The Coleman Sundome Tent has four models which are available on Amazon for 2, 3, four persons and six persons. It is 6 feet in height in the center of the tent so that an average man can stand. It uses a waterproof WeatherTec body and a TC fabric setup that keeps the tent sturdy while ensuring it will not slip off or wear out after a while. The Coleman Sundome Tent is a really well-ventilated, heavy-duty camping tent that may help to make an ideal accessory for the next camping expedition. This particular Coleman Sundome Tent features shock-corded poles that allow simple and fast set up of the tent. 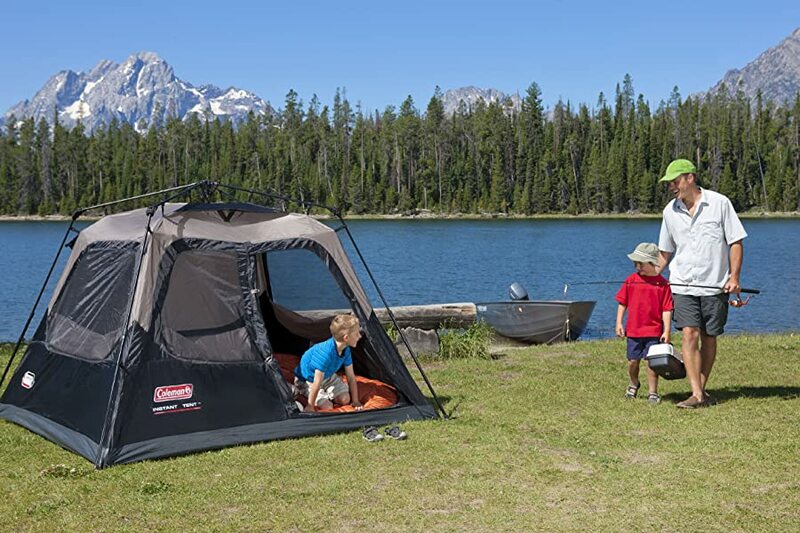 The Coleman Sundome Tent is perfect for two The Coleman’s exclusive WeatherTec feature and some other specialized and premium features can help campers to avoid bad weather and unpleasant storms. Coleman designs Climate Tec tents having a coated polyester material coupled with the anti-wicking line, webbing, and zip fasteners. All these features ensure that you remain dry in wet weather conditions. The tents welded waterproof ground, and inverted ground seams significantly raise the water level of resistance by hiding the needle holes in the tent. Coleman is indeed assured in its Climate Tec system and has exposed its Climate Tec tents to some rain in a test space that effectively simulated a nasty downpour. They also utilized a blowing wind machine with the capacity of throwing out hurricane force gusts to test the strength and durability of this tent. Even with these assessments, Coleman guarantees its tents will keep you dry during adverse weather conditions. The tent poles are easy to secure on this model. The risk of water seeping in through the floor is extremely Meanwhile, the poles themselves are very sturdy and will not be at risk of collapsing or easily becoming damaged. Customer reviews on Amazon state that they love this tent because they can easy to setup or taken down. Both actions need only about 10 minutes. Also, they can put a queen size air mattress in the middle but still have a lot of space. The low price but the good quality is the most things they are talking about. Coleman Hooligan Tent is a backpacking/family camping tent which comes in variable sizes for 2, 3 or 4 persons. This family camping tent is thoroughly coated with the polyester fly of 450mm that encases the tent from any rugged weather conditions. It is sheathed by an absolutely waterproof fly with possible extra storage in the vestibule. The tent has a separate space for footwear or gear to make the sleeping area comfortable. The tent also has a spacious base area with a waterproof bathtub base. One can expect good ventilation which can keep the tent cool and at the same time keeps the bugs out during outdoor camping. Here are few pros and cons for you to ponder before you buy. For the features offered, the price range is quite CHEAP. Hooligan’s bright orange color can actually work well if you are camping in a remote area. The dazzling color lets others know that someone is camping, and also is easily noticeable. This tent can be easily set up in less than 10 minutesdue to its single pole design. Upon upgrading stakes, you can expect multiple usages without runaway tents. It has a 6×8 footprintwhich can fit any tall person (larger than Coleman Sundome Tent). Consider the size before buying this tent; you should know that the Coleman Sundome Tent is a little smaller but cheaper than this tent. Single pole design makes the tent simple to set up. On the other hand, the walls of the tent cave in when exposed to strong winds. The stakes are made of aluminum which can be bent easily. Extended use of the tent is questionable if one sticks to these stakes. The best 4 person tent with vestibule! Though it is not an ideal backpacking tent it can be a good buy for a new camper for the price and space offered. This tent can sleep four persons and has a large interior with a footprint of 9×7 and a 3ft porch. It measures 68” tall upon setup and weighs 17.9 pounds. 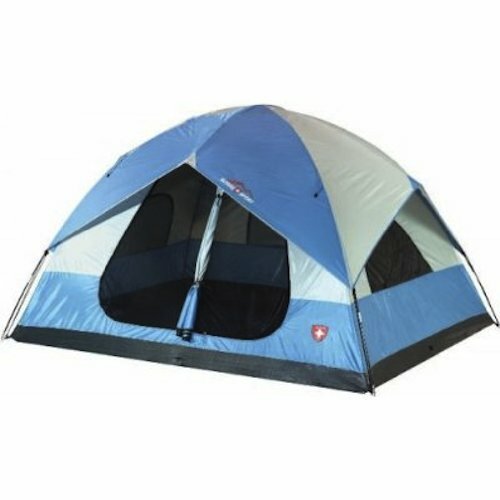 This tent comes with a detachable tent-fly which is included in the standard package. It has a middle tent for hanging a lantern and an electrical pole. During rain, the front area will not be affected as there is a drain area which takes the rain. Just pick the floor up and drain the water. Firm Insta-Clip attachments give firmness to the wind tested pole form. It has a huge space which can fit queen size air bed. It is very easy to set up. One person can peg it in 10 minutes without any support. This tent works fine with the Coleman seam sealer sprayed on to make it waterproof. The porch area interior remains dry even during heavy rain. Being a three-season tent, the cost is very cheap for the quality. This tent is a good pick for car camping but in bad weather, the absence of rain-fly of the porch can be tricky. Overall it is a spacious, affordable and absolutely the best 4 person tent with porch. This easy up tent is the BEST COLEMAN INSTANT TENT of easy up camping tents. Made of Tough2X Polyguard fabric (150D polyester taffeta), it has a weather Tec system with integrated vented rainfly. The special features such as the illumine reflective guy ropes can help you peg the tent in the night. Pre-attached poles stand true to its name Instant tent. It is much sturdier compared to other Coleman tents in this range. The tent set up will take CLOSE TO A MINUTE. Thanks to the pre-attached poles. Bugs can’t easily crawl in as the flap encasing the door zippers provide optimum coverage. The tent has plenty of air and light supply due to its well-facilitated ventilation. As per the claims, it does not sleep four persons in. It can easily pass for a 2-person tent. Though the tent has space, once you fill it with a large bed, the headroom disappears. Extremely difficult to clean up as poles with hinges are heavier, and one cannot shake the dust-out. The bottom window could have been better as it gets stuffy. It lacks privacy too, especially at night. This instant tent can be a delight to set up and tear down in a jiffy .This is a great camping tent for weekend trips. But looking at its features, it is not the best tent to use under extreme weather conditions. However, it can perform much better in dry weather. There are not many 5 man tents on the market. This best 5 person tent from Suisse Sport features a polyethylene body that uses a divider in the middle. The divider can be moved up or down as needed to create two rooms. Normally, under six person tent (under 6 man tents) often has only 1 room so it does not have PRIVACY or much CONVENIENCE. Therefore, Suisse Sport Yosemite 5 Person 2 Room Dome Tent 10′ x 8′ is another best option for those who really want a cheap but comfortable tent. A double-D door is included for entry and exit purposes. It uses an even divider in the middle so only one half can be open at a time, thus keeping the people on the other end of the tent from being bothered when it is open. This is very light in weight at only 13.5 pounds. It is six feet in height at the middle. Three mesh windows and a mesh ceiling are included. Each has its own zipper to allow air to move in and out of the tent when necessary. Only four stakes are needed to secure the tent although people can choose to add four more in windy conditions. Amazon’s reviews suggest that the rainfly is comfortable and large enough for most situations while setup is easy, what with there being no side extensions required. However, it also needs extra supports in the event that a windstorm ever comes around. Still, the tent does offer plenty of privacy as the mesh screens are dense and dark without letting in too much light. Should I Purchase a Four-Person Tent? Tent Capacity and Season Use: how many people in your family will need to be accommodated, and during which season will you be using the tent? For summer camping, a four-person tent with adequate ventilation is important to keep cool. Size and Weight: you will want to make sure that the tent is portable and easy to store and carry with you on all your camping trips. You should also consider how big you want the tent to be. Do you need to be able to stand upright? Are you using sleeping bags or inflatable mattresses? How much room will you need to move around and sleep the family comfortably? Consider the Budget: how much are you willing to spend on a four-person family tent for all your family trips? It is okay to spend a bit more money if you want to purchase something of a higher-quality that will be able to withstand several uses. Warranty Terms: finally, review the terms of the warranty on the tent you are thinking about purchasing. You will also want to consider buying from a name brand such as Coleman or Big Agnes to make sure that you are getting the value you are paying for. Setup and Transportation: most of the four-person tents currently available are fairly easy to set up and take down. A lot of the bigger brands are even equipped with a single pole structure, two pole structures, and pre-attached poles for an instant setup process. You can have your tent ready to go in under five minutes in most cases which means you can spend that extra quality time having fun with the family. In many 4 person tent reviews, it is important to think about your family’s wants and needs in order for you to settle on the best tent. There are a lot of other things you need to consider when buying a tent. For example, you need to know what seasons you will be camping, the size of your family and even where you are likely to go camping. If you only go camping in summer then you may want to buy a tent that has many windows and vents for the season but if you go camping more frequently throughout the year then you may go for a tent that can serve you through all the four seasons of the year. To buy a perfect tent for your family consider the following important steps. The next step before paying for a tent is to find the right capacity for your family. It is important to go for a tent that carried a high capacity than your actual family size. This way you will have extra room for other things. For example when you are planning for a 2~3 adult camping holiday then a 4 person tent will be a great one for you. Only consider tents that are the best perfect size for your family. The first important step in buying a family camping tent is to find the right size and weight. The size of the tent you buy may be restricted by a number of things, for example, the size of your car boot. Most family tents are made to be carried in a car boot. You, therefore, need to find a tent that best suits in your car boot. Look for a tent whose packed size including any extension can comfortably fit in your car boot. Other than just fitting into your car boot, you will also have to consider a number of other aspects of its full size. Next, do you want a tent that allows adults to stand up inside? Or you can do with one that adults can only stand at the centre? Or do you want room for changing cloth? The size of the tent often affects its weight. So you should also consider the weight. This especially important if you will need to backpack the tent at some point. When it is set up, do you want a tent that allows adults to stand up inside or you can do with one that adults can only stand at the centre and do you want room for changing cloth? The size of the tent often affects its weight. So you should also consider the weight. This especially important if you will need to backpack the tent at some point. Once you have made the choice of tent size and weight you have to check and find the tent that best suits your camping seasons. Tents are made for use depending on the season of the year. When buying a family tent you have to choose between the light 3 season (fall, spring, and summer) tents and the stronger 4 season tents that can protect you from winter, heavy snow or even thunderstorm. You have to select a tent that best suits your camping calendar. If you go camping all year round, then the four season tent is the best for you. However if you rarely go camping during the winter, then you may consider buying a 3 season tent. Once you have found tents that are matched with all your requirements, now consider the price. Only buy a tent that is within your means. If you are thinking about taking a camping trip for the first time it is important to remember that you may need to set aside a sum of money for any other eventuality. Luckily, most of the 4 man tents are cheap tents for camping.That gets you away from a headache. Again, do not need to think about the price. Just try to find the best 4 person tent for your family. Once you buy from Amazon, or the brand is famous as Coleman, Big Agnes, you don’t have to worry too much. However, there are many tents from China today. Be careful of their qualities! Most of the 4 person tents that are available in the market today are fairly easy to set up. Some of the famous brands come with a single pole structure, two pole structure, and pre-attached poles for an instant set up. They can be set up by a single person or two in a matter of 10 minutes. After many sessions, the setup time for these 4 person tents reduces to a meager 5 minutes. Once done with the camping most of these models are easy to tear down and repack into the carry bag. Transportation of tents depends on factors such as make and size of the tent. Single pole structured tents can be easily carried in a backpack while two poled and pre-attached structures depending on the weight of the poles and hinges are ideal for car camping. Being family tents many of them have custom made storage space designed for the needs of the family. It could be for gears, footwear or any such utilities. In comparison to small tents 4 person tent provide more space and hence privacy for 2 people. There are 4 person tent models with vents for air circulation which enhances the privacy during night stays. Dome shaped tents have a wide base which can provide ample footprint (Up to 6X8). A tall person of 6 ft can comfortably stay in the tent. Some of the models have a wide base (Dome shape) with angular walls to accommodate extra space. They usually have a broad head space (Dome type). If you are travelling with your group, you can choose 4 person tents as the weight of one of them is less than two 2 person tents. Hence, you can save and economize on cost and transportation. The majority of 4 person tents have floor space somewhere between 55 square feet to 65 square feet where in any average person requires roughly between 20-25 square feet tent area for a comfortable stay. In tent models with windows, one may feel stuffy inside while trying to protect their privacy with all the windows closed. Many family tents of this size have smaller vestibules compared to bigger tents. The potential for storing miscellaneous things while camping could potentially reduce due to this. Privacy can be difficult in this type of tent without a tent-fly or trap. I would put this way, family tents are well suited for light weather. Remember that in the cold, a dome tent will heat up faster also warmer than a cabin tent. Any 4 person tent has an ability to withstand a considerable amount of wind pressure. Domes handle the windy season easily but one need to compromise on space. Cabin tents suffer in winter or windy season but have an amazing floor space. Most of the 4 person tents cannot endure a rainy season without a rainfly to cover up and a seam sealer to make them waterproofed. Most of the family tents cannot tolerate harsh weather conditions. A 4 person tent of single pole model can concave during strong wind making the tent shrink. Whether you are a passionate camper or a newbie, affordability tops the buyer’s list along with quality and convenience. If you are a regular camper you may have a budget in place for your camping. On the contrary, if you are thinking to start camping then an affordable, cheap camping tents on sale will serve your purpose. They promise durability, strength for a long period, they are almost an investment. They are designed to endure hard weather conditions and climates. Also, they have a bigger and better space with more storage and vestibule. If you are planning to spend one whole season at camping site you can get an expedition kit. 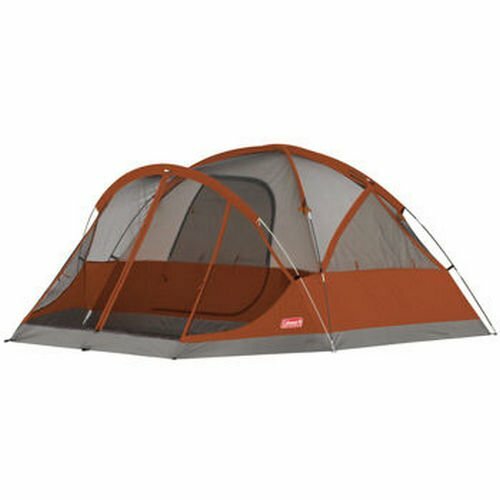 Coleman Sundome Tent, Coleman Hooligan Tent, Coleman 4-Person Evanston Tent with Screened Porch Canopy 9 Ft x 7 Ft Fits Queen Bed are so cheap that campers do not to looking for a good deal or tents on sale anymore. Dome shaped tents are very popular for new campers because they are simple and cheap. Even if you are a seasoned camper, you might still prefer cheap tents for light camping. Consider all the factors for your buy. The choice is yours. The choice of the right air mattress that would seamlessly fit your tent floor is one of those “foggy” areas many newbie campers get wrong. The mistakes people make when choosing a blow up mattress can be tracked back to two things: slopping of the tent sides and the height of the air bed. People know the floor size of their tent and the dimensions of the sleep surface of the airbed and they make their choice based on those two numbers, which the wrong way to go about it. Choosing the best air mattress for your specific needs has to take into account the slopped sides of the tent and the elevation of the blow up mattress. When we say smaller here, we don’t mean literally. We are referring to the fact that some space is lost between the angles of the tent and the sides of the inflatable mattress. For reference, below are a few guidelines that you can go by when making the choice for two most popular size of airbeds – Twin and Queen. Twin air mattress will take about 22-24 square feet of space (the sleep surface). If you take into account that the airbed can be raised anywhere from 9-25 inches that number goes up to 26-30 feet. Queen air mattress will take up about 33-34 square feet. The profile height is in the same range as the twin airbeds. To make sure it’s a good fit, think about the bed height, measure the dimensions of your tent at that height point and visualize how it affects the space. To simplify it – for comfortable sleep and functioning inside the tent, you can use the rule of thumb that the tent floor space has to be at least 3.5 times the space an air mattress takes up. This type of tent has a more traditional shape, and design and the ridge are set up to hold the roof. This particular tent is popular for being more stable than others and has a very easy setup process. Flexible poles are formed into half circles to give dome tents their shape. The sides are vertical which allows for improved headroom while inside the tent, which also allows campers to stand upright and walk around. It is a stable tent option and has a wider floor area. These are common tent types and are typically made from long coiled frames that are permanently fitted within the fabric. This design allows for instant setup and is a practical option suitable for a variety of different weather conditions. Inflatable tents are also easy to pitch. All you have to do is peg the corners and switch on the compress for the tent to be erect. However, this type of tent can end up being a costly option and will add some weight to the backpack and make it harder to carry. Tunnel tents are a popular choice for those looking for a good family tent. The tent is made similarly to the dome tent, but instead of having flexible poles that cross one another, they are instead placed in a line to create a tunnel design. The tunnel design provides much more room for a family. I bought a 4 person tent but later discovered that it could not fit the four of us. Why is that? 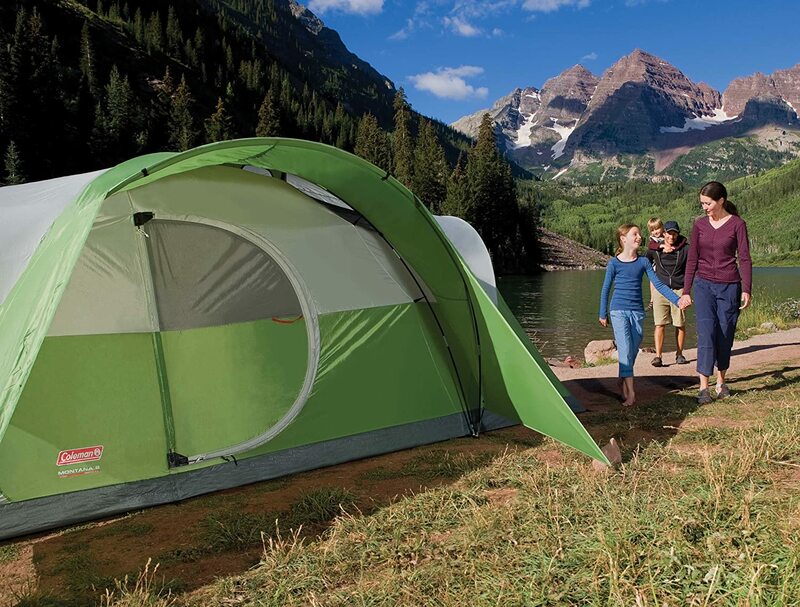 Family tents are usually sold as 4-person, 6-person 8-person and so on. This number is just a representative of the maximum number of people who can sleep in the tent at the same time. However depending on your physical size you may not be able to fit in the tent comfortable six of you. It is, therefore, important to verify the tent size before buying it. What is the major difference between a 4-season tent and 3-season tent? All 4-season tents are designed for snow campers although they can be used during the rest of the seasons. The 3-season, on the other hand, cannot withstand the snow stress and loads of the winters. How can I tell the model name of my family tent? All tents including family tents have a small 2″ x 4″ tag attached beneath the door zippers that contain the model name and all the other important information about your tent. What can I expect to be the life span of my family tent on average usage? The average life span of a family tent being used about 2-3 times a year of 3-7 days per use is 7-10 years. I bought a 4-person tent but later discovered that it could not fit the four of us. Why is that? Family tents are usually sold as 4-person, 6-person 8-person and so on. This number is representative of the maximum number of people who can sleep in the tent at the same time. However, depending on your physical size, you may not be able to fit that many inside the tent at one time comfortably. Therefore, it is important to verify the tent size before buying it to make sure it can fit everyone in your family, as well as all your gear. All 4-season tents are designed for snow campers although they can be used during the rest of the seasons. The 3-season tents, on the other hand, cannot withstand the snow stress and harsh conditions of the winter months. This is where knowing in which season you will be camping most frequently comes in. What can I expect to be the lifespan of my family tent on average usage? The average lifespan of a family tent being used about 2-3 times a year of 3-7 days per use is 7-10 years. This lifespan is also based on how well it is being cared for and maintained. Do not let heavy objects, such as chairs, lean against the canvas of your tent. They can damage it in the process. When it is raining, avoid the temptation of touching your tent to feel if it is leaking. Because, where you touched your tent, it may cause water to be suspended thus increasing chances of leakage. I hope this guide has helped you with your journey to find the best four-person tent for your next camping trip and I have offered the best tips possible to suit your needs. Hello, it’s Will Young and I welcome to Family Tent Center. If you are planning on camping outdoors with a big group of people, then you will want to have a sturdy and spacious tent that is large enough to accommodate all these people. A spacious tent means a more comfortable resting space, a spacious storage area, and also provides ample sleeping space. Larger tents, or cabin tents, are manufactured with a specific purpose in mind; to accommodate up to ten people while being able to adequately provide for their recreational needs as well. Several factors will determine which tent will best suit your camping experience. One of the biggest factors would be the type of tent. Large camping tents are best used in cabin tent form which allows campers the ability to walk upright while inside the tent. What Type of Camping Will You Be Doing? Before purchasing any tent, you will want to figure out what kind of camping you will be doing. If you will be out in the wilderness in rougher conditions, then you will want to find a tent that can stand up to these harsh conditions. On the other hand, if you will be camping at a camping site, then you should still find something durable, but you won’t require something as heavy duty. The most popular materials used for camping tents include canvas, nylon, and polyester. 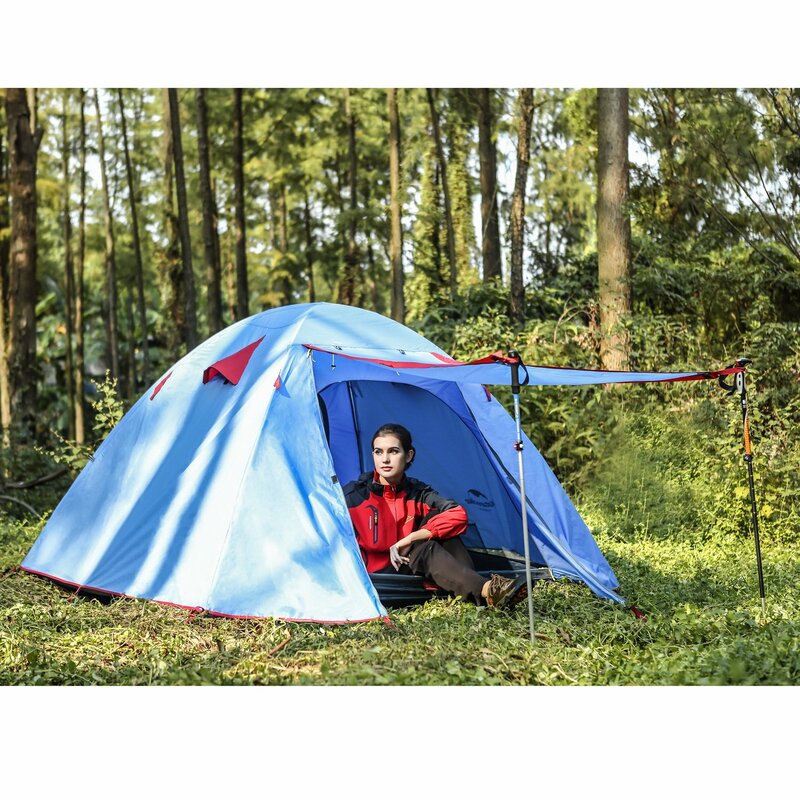 All these materials are suitable for a variety of camping conditions, and each has their own advantages when it comes to durability and strength. Cotton will retain heat during cooler weather and is a very breathable material. Nylon is usually less expensive, and the fibers will not absorb water, so you can often find these tents to be waterproof and also have additional UV protection benefits. Polyester can stand extended sun exposure, and the material is slightly thicker than nylon. Price is important, and a budget should be set prior to making a purchase. You want something that is high-quality, but you also want to stay within a reasonable budget. Space is a factor you should consider as well. Think about the locale in which you will be camping and if it is going to be able to accommodate such a large tent. Assembly is also a factor. How long will it take to set up and how many people will have to help? Portability is the last feature to consider. How heavy is it? Will it be easy to transport and store? The lightweight Mountain Trails Grand Pass Tent – 10 Person Tent was designed while keeping the avid outdoor lover in mind. A removable fly plus mesh roofing vents help keep air in the tent fresh and circulated. Dutch “D” designed doors with inside scoot windows offer you lots of personal privacy. More than ten people can sleep in this Mountain Trails 10-person tent. So, it’s ideal for group expeditions. This tent provides a lot of space without the hassle of a lot of extra weight. The rainfall travel keeps the camping tent dry in rainy conditions and also offers some shade above the entrance way. The zip-open windows provide oxygen and help keep you cool during the night. You and your group can definitely sleep comfortably inside this large family tent, and you will have adequate space for everyone’s belongings. Other features of this family camping tent include two back-to-back D-style Dutch doors for easy access and exit, the welded polyethylene ground to keep out water, mud mats to keep the tent thoroughly clean, and a hooped fly for additional balance and rain protection. In some cases, entry zippers are a genuine hassle, and zippered vents cannot be used at night (dew pours in). There is also no entrance hall. 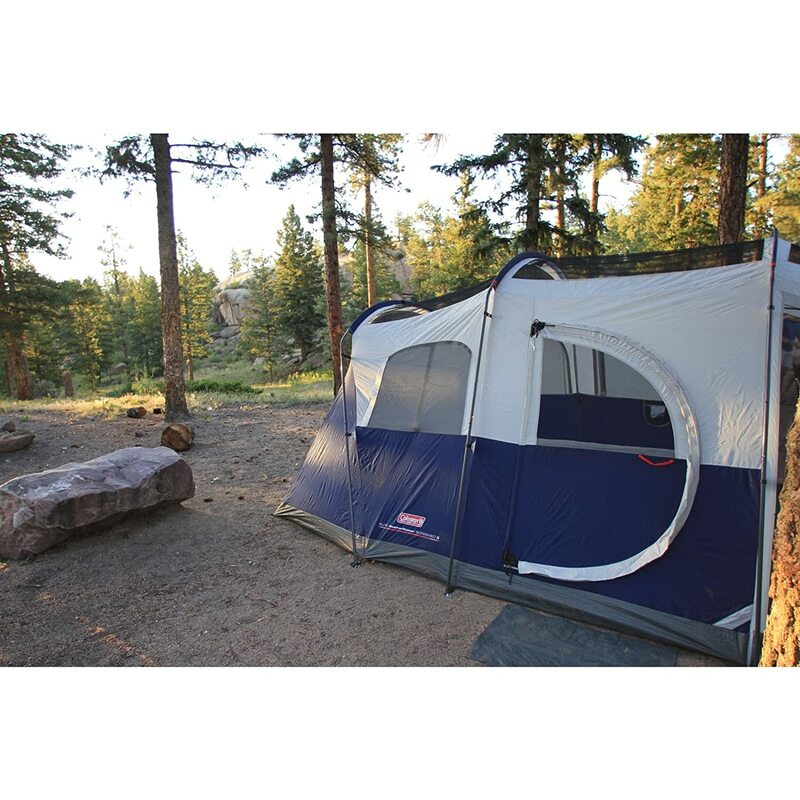 This camping tent is ideal for large groups or large family camping trips. Campers will get plenty of room to stretch out, stand, or store their gear. Please check out the Coleman WeatherMaster 10 Person Hinged Door Tent video review before continuing with our review. Coleman has gained popularity due to its high-quality production of outdoor products. Campers who take extended trips should definitely consider this tent brand. For the past one hundred years, Coleman has prided itself on staying at the cutting edge of manufacturing when it comes to creating recreation products that are designed for outdoor use. And the Coleman WeatherMaster 10-Person tent with the hinged doors is proof of that. This tent, with its two rooms, proves to be spacious enough for big groups to relax and sleep soundly. Extreme weather conditions such as strong gusts of wind or torrential downpours cannot beat up this durable tent. However heavy the rains get, the WeatherTec system still allows the interior to stay completely dry thanks to Coleman’s patented WeatherTec system. The floors are welded, and the seams are inverted so that no drops of water can leak into the tent. The hassling task of setting up a tent is made easier than ever with this tent, which earns itself praise. One reviewer said that it took them only 15 minutes to put the tent up even when it is dark outside, thanks to its color-coded poles. However, he added that this task required 2-3 persons because of its large size. The Coleman WeatherMaster II Screened 10 Person Tent is the larger edition of the best six person tent with screened porch. True to its name, this 10-person tent is spacious enough to fit ten campers comfortably. The unique feature of this Coleman product is that it can provide enough room for four queen-sized air mattresses without any difficulties, which means you and your fellow campers can enjoy a comfortable and roomy stay in the tent on all your camping trips. Hinged door: The door is hinged onto the canvas, which enables you to swing open it to come in and out quickly and easily. Auto-roll windows: Equipped with built-in spring, the windows can be rolled automatically, thus saving you from the annoyance of manual rolling. You can unzip them quickly. Screened Porch: It offers more shadow, saves you from the outside bugs, and more especially, it can change into a bedroom having a separate zippered door. With a dimension of 16 ft x 10 ft, and a 7ft height in the center, this Coleman tent allows grown adults to stand up inside the tent. 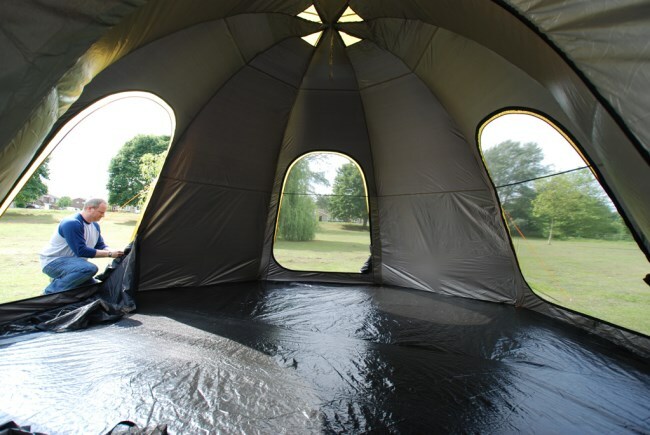 A rainfly is installed to protect campers from severe weather conditions such as a rainstorm. On good weather days, you can enjoy the gentle sunlight through the mesh roof. Similar to other Coleman products, the floor is designed to be moisture-resistant. This tent is a good value for money for a 10-person tent. Campers who go in big groups or families should consider this tent for ample room to rest comfortably, stand easily and store their stuff neatly. I’m happy to say that most customers showed their satisfaction towards this tent because it offers them a camping stay without facing any discomfort. The great feature is that it can be hassle-free converted from a screened porch into an appropriate bedroom. Indeed, this tent can provide enough space for ten people, and still have a spare room for storing your bags and other miscellaneous items. Besides the above outstanding features, one thing of the tent customers are dissatisfied with is that the setup process is not clearly instructed and is time-consuming (it takes more than 20min to put up the tent). However, in general, this tent is fantastic!!!! Users especially LOVE LOVE LOVE the D-shaped hinged door and the auto-roll-up window shades! The Ozark brand takes its name from a popular trail in Missouri, and they are well-known for producing tents and equipment for outdoor use which are well worth your money. With its reasonable price and a package of excellent features, this tent brand will bring you numerous benefits sure to fit your various camping needs. The Ozark Trail 10-Person 3-Room XL Family Cabin Tent is the ideal large camping tent for campers who come in groups of ten and sometimes more. The tent is spacious enough for ten sleepers and has enough room to accommodate three Queen -sized mattresses, with even one more room to spare. Included in the package is a room divider that allows you to separate the tent into three different rooms. The room divider brings you even more privacy to rest in comfort. This tent can accommodate up to ten sleepers or 3 queen-sized mattresses, and there is still one spare room. The tent has three doors, one in the center and the others are fixed on two sides. Each side door has its own entrant and exit, giving users enough privacy. It has six windows for improved airflow and atmosphere. Those windows offer campers a wide view of the camping site and even a night of stargazing from inside the tent. Pre-assembled poles help you put up or pull down the tent more conveniently. A durable floor and tent fabric prevent it from early deterioration. The floor’s material is polyethylene, which is fully welded and fixed into the tent’s walls. Space inside is large enough to accommodate up to twelve adults. The tent can be divided into three separate rooms using included dividers. After rains, you can detach the fully-taped fly to obtain a panoramic view of your campsite from meshed windows and ceiling. The tent is equipped with an advanced ventilation system allowing cool air to flow in by adjusting the vent while hot air flushes out through the ceiling. You will stay in comfort no matter how hot the weather is. Worrying about water leakage? Then be happy with the Core H20 Block Technology, a combination of water-resist fabrics, sealed seams and door/window seals that let the water run off faster and keep rain out of your way. Doors and windows are installed with zippered panels for privacy. There is a double door to enhance entrance convenience. If you want to store miscellaneous items to keep your tent neat and tidy, just go for pockets and gear loft fixed on the wall. If you intend to go camping with your families, you will be satisfied with this tent because it offers large space for large families. What’s more, you will feel ultimately comfortable due to the great ventilation provided by its meshed doors and windows. Compared to a tent for 10 persons, this product is a real value for money. However, there is one drawback some reviewers mentioned. That is the poles are not quite durable. This can be explained by a forceful tight when pulling or maybe by faulty poles. Another disadvantage is it takes time and more than one adult to put up the tent, partly because there are too many poles to handle. 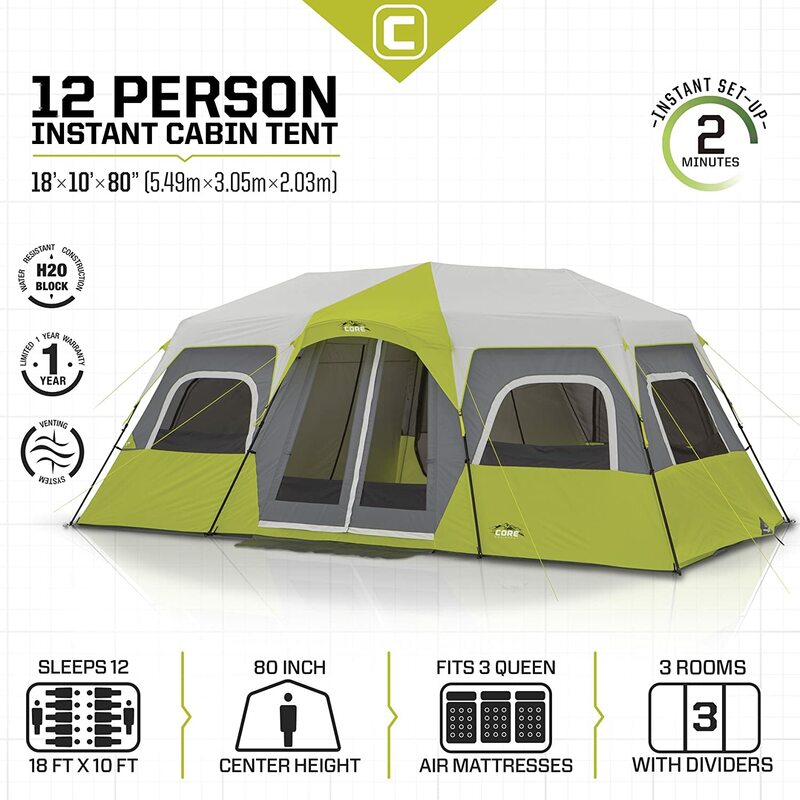 You know, I read very carefully all of the customers’ reviews of not only this 12 person tent but all of the CORE Instant Cabin Tent family. I was so excited when I saw all of them get 4.5 star rating. That’s very very high for a camping tent! Let’s watch this video to find out why it can get such a high rating feedback! Of course, the best thing of this 12 person tent is the INSTANT feature. I saw people easy set it up within 2 minutes by my own eyes! It’s AMAZING for a 12 person tent! 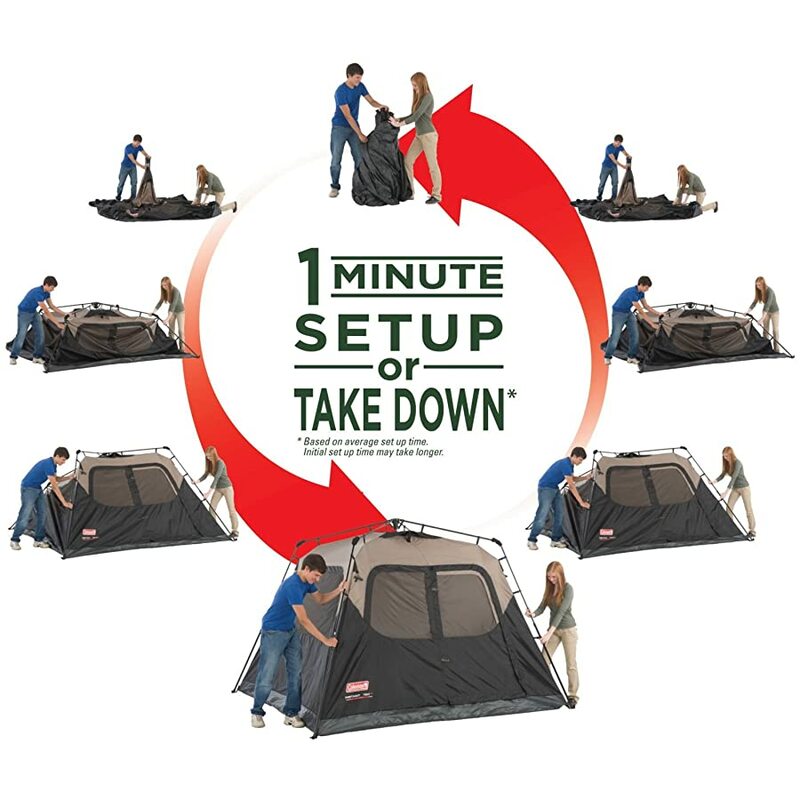 You only need at most 2 minutes and don’t have to shed any sweats over setting up this 12-person instant cabin tent! Ozark Trails Instant family camping tent is a good product, though having a lower price and a little bit different design compared to 3 room instant cabin tents. Moreover, if you want to store some objects or just take off your muddy shoes, you may do it right on the large area in front of the entrant door. With poles readily attached, this tent will take you by surprise when it comes to assembly – only 2 minutes to get your job done! I’m pretty sure with you that this 12-person tent can do wonders! Families who take extended camping trips can look on it as their best choice, with three spacious separate rooms in total offering you the desired privacy. I think that it can definitely do its job for family gatherings on special occasions like Thanksgiving, Easter, and Christmas and so on. It’s impossible to carry this sizeable tent by yourself, so just let your car help you. I’m sure with you that I have carefully read all the reviews written by customers of this 12- person tent. To my surprise, this tent is all rated 4.5 star, which is a high rate for such camping tent! I did see campers set up the tent in only 2 minutes. And, if you want to camp with other 11 persons, then don’t worry; this tent can fit for all. One thing to remember to extend the tent’s life is that it needs being properly packed up. So, when it comes to disassembling, take the time to fold up the tent carefully to keep it with you as long as possible. 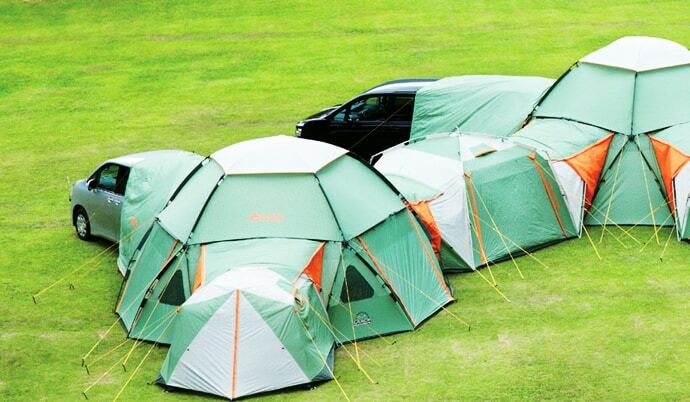 This is the best 12 person tent ever! It’s very difficult to get 5 star rating on a large volume of buyers! And this Browning Camping Big Horn Family/Hunting Tent did it! An awesome 12 person tent! Tents for family use need to be spacious, protective and reliable. Such qualities and even more are what you can find in the Big Horn. I tell you one truth, the Big Horn is worth being mentioned in your conversation about the best waterproof tent. This tent is perfectly water resistant, so there’s no need to wonder whether you are kept dry in case of heavy rains. Watch the very short video below to discover why it is the best waterproof tent. This tent has enough space for 12 persons. The tent can be bisected by a wall divider. The wall divider allows for privacy. Straight walls help extend the tent’s interior space. You can easily go in and out of each separate room through 2 big doors. Doors are sewn with extra-sized zippers. Setting up the tent is a very simple task for you when you choose the Browning Camping Big Horn Family/Hunting Tent because it offers a 3-pole design. This task becomes even more convenient with the aid of the steel uprights, steel stakes, and fiberglass poles. Its Unique Hub Design makes assembly easier. Tent assembly is facilitated by pole clips that can stick to the poles in an eye blink. Six windows offer efficient ventilation. For storage of miscellaneous items, you can look for storage pockets available in the tent’s corners. The tent is equipped with 2000mm coating its 150D polyester oxford floor, plus a UV-resistant 75D 185T polyester fly, making it the best waterproof tent. With 75D 185T polyester fly buckles, the tent can be adjusted and protected to the highest extent. The tent is more protected from the bad weather with the aid of floor seams, guy ropes and fly sealed to it. The tent is completely made of high-quality materials. It includes steel stakes, guy ropes, and mesh storage pockets. Compared to a nylon floor, the 150D oxford floor is double weighted, sturdier and more durable, enabling this tent to be used throughout every season. For families going on extended camping trips, this tent is an ideal choice, plus 2 spacious rooms for individuals’ privacy. Adjustable fly buckles allow campers to have control all over their tent. All in all, the tent’s structure is perfect for varied environments and areas. Amazingly, Browning Camping Big Horn Family/Hunting Tent is positively reviewed, receiving up to 5 stars from most reviewers on Amazon.com. According to other reviews, the Big Horn tent is very flexible and can come in different shapes, with some users even posting photos of their tent. Although there are still some complaints, in general, you can be assured that this tent brand receives numerous praises, much more than that of expensive brands online. They generally accept that the tent is easy to assembly and is spacious enough for even large families. Customers are satisfied with not only the durable tent but the reliable and responsive customer service. More noteworthy is that while other tents often experience the water leakage, many of the reviewers, even when it was raining torrentially, said that there were no water drops leaking into this tent. Such advantage does give this tent a head start over others. No doubt, this tent must be crowned as the Camping King. Why? Because there are no other tents but this can fit a full number of 14 sleepers. Enjoy your comfortable days with warm sunlight or zip the tent up for a sound sleep when night falls. It is made of high caliber polyester fabrics, which means you can have it both ways: whether it is warm or cold, you can feel the same comfort. The windows are designed in such a way that you can shut simply at night and may open to welcome fresh and cool daylight. Guy ropes are included in its package to secure your tent in case of strong winds. Now, let’s watch the video review! Tahoe Gear Glacier 14 Person 3-Season Family Cabin Camping Tent w/ Rain Fly has been designed specifically to provide an ample space for 14 people at most. Such efficiency and versatility mean that you can choose this tent for a smoothly-going family camping trip. The generous 7’ center and high wall enable users to go in and out without having to bend down their body. The tent goes with a rain fly, which means the windows’ upper part is fully covered and you are safely protected from rains and dews outside at night. To offer more coverage, the tent includes a fly canopy reaching beyond the door, with each side equipped with guy ropes for fortification in case of strong winds. More interestingly, the fly is like a solar shield, bending back sunlight and cooling the tent when it’s getting hot. For a sound sleep at night, all you need is to zip up the windows. The tent’s fabrics are made of durable polyester 1200mm thick, making it a perfect choice for a camping trip regardless of warm or cool weather. Durable tent’s bottom helps the tent stay with you for longer. It is perfect for large groups of campers or families. This tent is suitable for both day and night time camping. The tent’s amazingly large size is the hot topic in Amazon reviews. Reviewers show their amazement towards the great number of people this tent can accommodate. The windows offering wonderful aeration are in the center of their conversations, too. However, there are a few users complaining about the screened doors and insufficient guides on how to set up the tent. Overall, this tent, produced with desired quality, equipped with good ventilating windows and a rain fly, is perhaps your best choice. So, my suggestion is just included this tent in your buying list if you are seeking for a value-for-money tent. … then I have to say sorry because that tent should abdicate to give way to this New King! Amazingly, Tahoe Gear Ozark 16-Person 3-Season, true to its name, can comfortably fit the room of up to 16 sleepers. This Ozark, colored in orange, is a perfect tent you are looking for if you plan to camp with friends or family members for long days. Everything needed can be found in this tent: poles and stakes designed for simple assembly, and guy ropes and a rainfly included for unforeseen bad weather. There are many rooms, offering a spacious place. The main room is spacious enough to fit a queen air mattress, with a walking aisle of more than 2 feet on each side to spare. An ample 7’ center and a high wall offer easy entrance and exit, plus spacious room for all campers. Large but not at all bulky, this Tahoe Gear Ozark offers you and your fellow campers the comfort and convenience you want. A plentiful number of mesh windows and vents fixed on the floor provide the tent with sufficient aeration the whole day. The mesh designed openly means the air flow is effectively ventilated. Also, extra ventilation comes from floor vents in each room. Fly canopy reaches beyond the door to cover a larger area, incorporating guy ropes on both sides for fortifying the tent when it gets windy. The fly featuring a solar shield comes in handy when the weather is hot, for it helps reflect sunlight and keep the inside cooler. The tent’s fabrics made of durable polyester 1200mm thick renders it a perfect choice for an outdoor trip whether it be cool or warm. Equipped with shock-corded poles and a system of ring and pin, the tent proves to bring you a hassle-free setup task. 1200mm polyester fly coupled with taped seams and binding floor made of polyethylene help block out water no matter how the weather is. This tent is suitable for both day and night time camping, for music parties, and for you to get away from it all. It is an ideal tent to get you, your sidekicks or family members safe and sounds on an extended camping trip. Customers, in general, are all satisfied with this tent brand after using or trying. Most importantly, with the aids of color-labeled poles and highlighted markers of these tents, the usually hassling task of setting up becomes surprisingly hassle-free. 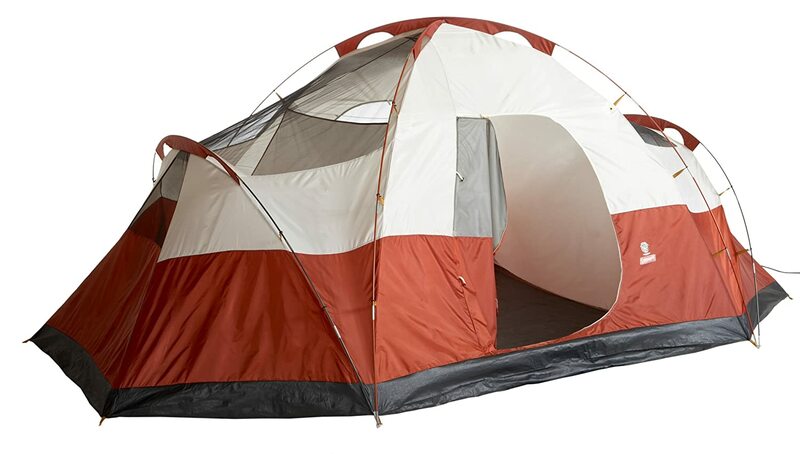 This tent is favored regarding its big size, great ventilation, and sturdy structure. The fact that it is made of thin fabric, so easily suffering from wear and tear, is its only weak point. However, I am pretty sure that this weakness can be improved by putting an extra tarp under the tent, or pulling the tent onto a hard rock for another solution. Who needs those LARGE FAMILY TENTS / 10 PERSON TENTS? Large tents are very much essential for a large family, group of families or friends. The advantages of an extra-large camping tent are mainly in its ability to provide more storage and living/playing space than a smaller tent. If the weather turns nasty while you are camping, then it is good to have a dry area in which you will have shelter and can also prepare and eat meals in comfort. Another advantage of an extra-large tent is its capability to divide the tent into separate rooms. Nowadays extra-large tents come with room dividers. 10 PERSON TENT or a smaller one? If you are going on a camping trip with several people, then you will find it to be more convenient to house everyone in a large tent such as a spacious ten-person family tent. These types of tents offer ample room for sleeping, hanging out, and storage. They are also big enough so that everyone can walk upright while inside. Most ten-person tents come equipped with room dividers so that you can divide up all the available space within the tent. This allows you to designate areas for specific purposes such as sleeping areas, storage areas, and eating areas. The room divider also allows for some extra privacy in case you need a break from all the other campers. When you imagine a comfortable and spacious tent, you should consider Mountain Trails Great Pass 18×10-ft, 2 Rooms, 9 to 10-Person Dome Camping Tent. It really is uniquely designed to meet the needs of large family groups who like camping. This camping tent can hold around nine adults. At the bottom, it measures 18 feet by 10 feet. At its middle, it measures seventy-six inches higher. With this sized tent, the camping tent enables its residents ample room for all of their activities and needs. Its pin-and-ring construction and fiberglass poles permit campers to set up the tents quickly and easily. These tents also provide sufficient cross-ventilation which helps campers stay cooler on warm nights. If you want privacy within the tent, it is possible to separate the tent into various areas allowing the campers some much-deserved privacy. HOW TO MAINTAIN & STORE EXTRA LARGE CAMPING TENTS ? 12 MAN TENT OR BIGGER? Under particular conditions (winter, high humidity, and so forth) condensation shall form within your tent. Condensation will be due to water vapor from your own breath, sweat, or any wet clothes inside the tent. It isn’t leakage through the camping tent material. It could be reduced by removing damp clothing from your own camping tent and by providing great ventilation through the camping tent. Tree branches, tree sap, parrot droppings, or dampness steadily dripping away tree limbs could cause damage to the camping tent material and its covering leading to leaks or even lack of flame-resistant qualities. Don’t store tent, for a short period of time without drying it. Usually do not pack buy-ins or poles within your tent. Use an individual storage bag. Stakes should be eliminated by pulling around the stake itself. In no way draw on the camping tent to eliminate stakes that could bring about house damage or accidental injury. Don’t keep the tent setup for weeks at a right time. Remember that contact with ultraviolet sun rays from sunlight may seriously damage materials and/or lead it to turn out to be discolored. WARNING: Keep all heat and flame sources from this tent fabric. The flammability is met by this tent requirement of CPAI-84. The material may burn if remaining in continuous connection with any flame source. The use of any foreign fabric to the tent may render the flame-resistant qualities ineffective. All poles plus stakes should be put into the storage handbag to avoid harm to the particular fabric items put into the carry situation. Make certain tent is dry and clean before placing in carry situation. Remove rainfly, disseminate on floor associated with tent, and unzip doorway & vents before getting tent down for storage. 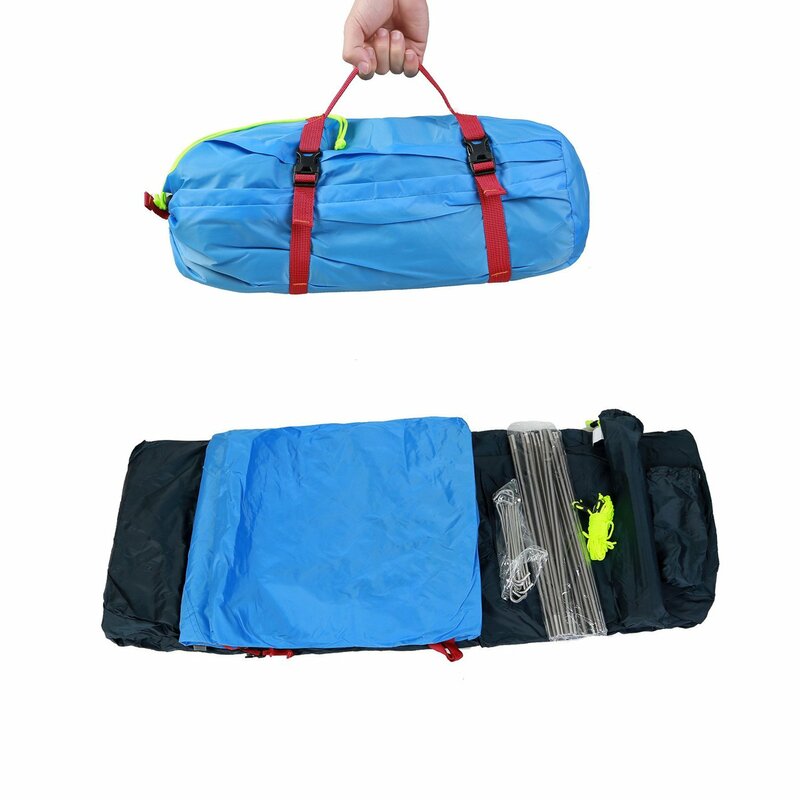 Neatly fold tent to width of pole storage handbag, place on camping tent, roll firmly, plus invest carry situation. Store in a clear, dry region. The Best 10-person tent is designed for group camping and has a convenient layout that provides living space to accommodate larger groups of people. The standard of building, the level of convenience and ease, and all the small details combine to determine the tent’s suitability and price. The initial ease of setup and breakdown, the presence of individual rooms in the ground floor plan, the presence of adequate entry doors, practical airflow, and effective safety and protection from the elements are all features you should be looking for before purchasing a ten-person family tent. So, read the above reviews attentively, do your research, and read other reviews online, and you will be able to find exactly what you will need for your next large family camping trip. Start with our first review of Mountain Trails Grand Pass Tent 10 Person! With so many different tent variations on the market today, it may be challenging to narrow down all the possibilities to find the best family tent for your trip. When you are looking for a family tent or a tent that is big and spacious enough to accommodate more than just one or two people, then the most commonly sought out tents are usually the six-person and eight-person tents. A six-person tent with a screened porch area is the ideal camping tent for a small family because it offers plenty of comfortable sleeping space as well as an area for the kids to play or for the family to share meals or store their gear. Top luxury camping tents: KODIAK CANVAS FLEX-BOW TENTand BIG AGNES – FLYING DIAMOND TENT, of course, they are expensive. Please click on their names to read our reviews. The top large camping tents for 6 men are Coleman WeatherMaster 6-Person ScreenedTent and Coleman Elite® WeatherMaster® 6 Screened Tent with 17f x 9f (all have a 6f x 9f Screened Room). They are both best 6-person tents with vestibules. There’s a lot of 6-person tents with screened porch areas. You can have tea or enjoy the view without worrying about sunshine, dust, wind or bugs. There are no backpacking tents that can accommodate six people. If you still want a backpacking tent though, please check our best backpacking tent review! Six-person tents have many awesome advantages for small family trips. They offer adequate space in terms of square footage as well as height, and some even come with room dividers, so you can maximize your space and dedicate each area for either sleeping or eating, or however you want to divide the space to suit the needs of your family. All of these premium features make your camping trip a more comfortable and convenient experience. Also, the WeatherTec system is truly marvelous! This particular Coleman WeatherMaster 6 – Individual Screened Camping Tent has been made to support six people within two rooms. This particular camping out cabin camping tent also includes a heavy plus strong metal fiberglass frame for strength and durability. It delivers exceptional protection plus comfort and ease during each extended family camping trip. Setting up this tent is fairly easy and straightforward. However, it is a large tent, so it may take you up to thirty minutes to assemble, and you will most likely need a second set of hands to place the rain fly on the roof. Once assembled, the tent is spacious with ample headroom so that everyone can walk upright inside of the tent. The Coleman WeatherMaster 6 includes two entry doors with a hinged entryway for simple access. Vent windows are provided to ensure proper ventilation and also awards more privacy. The floor is made from a polyethylene material, and the inner mesh is manufactured out of polyester material to provide resilient durability. 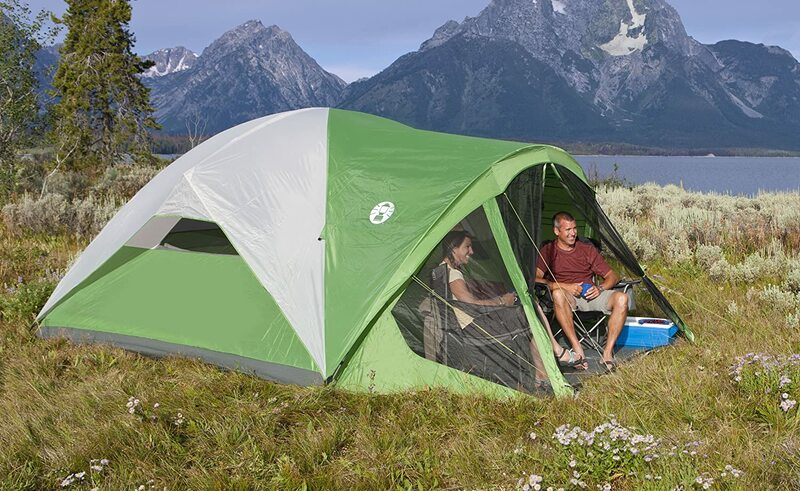 The Coleman 6-person tent with screened porch furthermore possesses an electrical entry port to provide simple usage of your digital equipment. WHAT THE CUSTOMERS SAY (AMAZON CUSTOMER REVIEWS)? The Coleman 6-Person Instant Cabin Tent helps make camping easy and more convenient so that you can enjoy every moment of your outdoor adventure. In about ONE MINUTE you can have the tent set up or taken down. The spacious camping tent can also fit two queen-sized airbeds. Two inner storage pockets provide a convenient place to put your necessities, so they are close by. The durable Bodyguard 2X material, the exclusive Climate Tec program, plus an integrated, vented window keeps you safe from the weather rainfly. You will like the Illumining reflective guy lines. They are featured alongside the pre-attached rods of this instant log cabin. The Coleman 6-Person Instant Tent is made from a fabric material that is two times the thickness of other standard materials. This type of material lends more in the way of preventing rips, tears, and damage. Also, it is a fully-taped camping tent, so no rainfly is actually necessary. The revolutionary one-piece design indicates that the poles are pre-attached to the camping tent. This makes assembly easier, and there is no chance of coming into the issue of lost or missing parts. Simply unfold the camping tent, disseminate the material, extend the rods, click on, and secure, and your tent is ready to go. WHAT THE CUSTOMER SAY ABOUT COLEMAN EVANSTON 6 SCREENED TENT? This model is an upgraded version of the Coleman WeatherMaster 6 that was introduced above. The Elite model has a remote and built-in lighting system with three brightness levels and metal strips that allow you to control the windows, so they easily roll up or down. This light system is the greatest thing because you don’t have to look for your tent in the dark. It remains visible. The regular Coleman WeatherMaster 6 doesn’t have a lighting system. It is the only important functional difference. Before purchasing a six-person family tent, you should always read through customer reviews from the online marketplace you are buying it from. 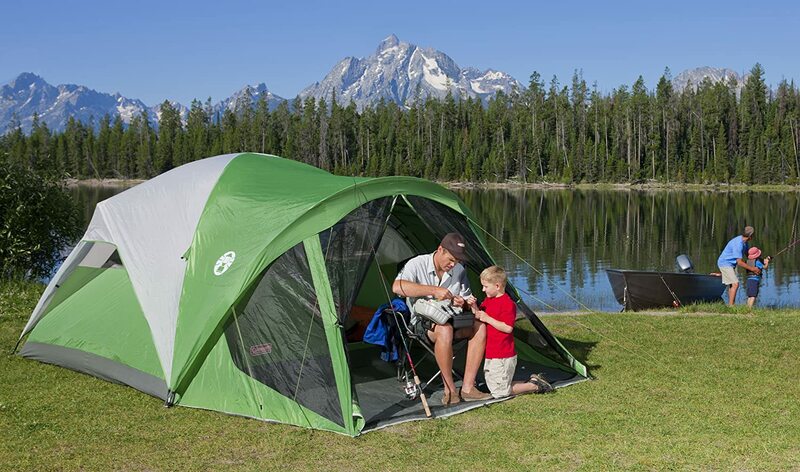 You should also consider purchasing a family tent from a well-known manufacturer such as Coleman, Outwell, or Vango. Additionally, it never hurts to visit your local camping store to see a few of the tents already being displayed to get a better idea of the size and functions of each six-person tent you are considering. When looking at six-person family tents, you will want to consider the overall size and weight of the tent. Most family tents will need to be able to fit into the car to transport them to the camping site, so you will want to consider the packed dimensions of the tent as well as the dimensions when it is set up. You will also want to make sure that your family tent has enough room to be pitched in the camping site area you have found and reserved. As a family, you will want to consider how much space you will need inside the tent. You want to make sure there is plenty of wiggle room, so everyone can move around and not feel enclosed in a small and tight area. This is especially true if you come into some adverse weather conditions and you need to spend a considerable amount of time huddled inside the tent. You should also consider how much headroom is available as well. Will you be able to stand and walk inside of the tent? Ventilation is also an important factor to consider when choosing the right six-person family tent. With so many people inside of the tent, you will want to be sure that you have a well-ventilated tent, so everyone can breathe a little easier and not get too hot and stuffy. Doing so will also help everyone sleep a lot better, and it will allow the air to circulate nicely throughout the tent. The mesh materials usually used in the tents to allow for proper ventilation will also do wonders when it comes to keeping bugs and other creepy crawlers from entering the tent uninvited as well. 6-man tents are fitted with tent poles that are bent into a fabric cover and pressed against one another. The tent poles cross and form an inflexible and stable structure. A dome tent will typically have fabric walls, but they are also generally found to be wind and waterproof to some extent. The fabric used for this type of tent is also usually a lot stronger and more durable than the materials used in a standard tent’s construction. A dome style tent offers more room than a standard tent due to its design and shape. They offer a wide and open space on the interior which allows for increased floor and headroom. A dome style tent offers a family of campers more strength and wind breaking abilities, and they stand taller in the center, and the walls will be more sloped, so the room on the sides is more limited. However, they are the best tent to have if you find yourself facing stormy, windy, and rainy weather conditions during your trip and you find that you need a bit more room to move around. Question: Exactly what is a tent? Answer: A tent is a form of sheltered protection made from sheets of fabric that have been mounted on a durable framework of poles or even rope. Smaller sized tents can be free-standing or attached to the ground at the bottom. Larger tents are often anchored using guy ropes that are linked with stakes or tent pegs. Question: Exactly what is a freestanding tent? Answer: A freestanding tent is one that can stand alone without the use of any stakes or other type of anchor. They are also known as self-supporting tents. They are ideal if you are looking for a tent you can set up quickly and easily and are usually very spacious. Question: Exactly what is a non-freestanding camping tent? Answer: A non-freestanding camping tent is a tent that requires stakes plus guy points to give it stability and the ability to stand upright. Numerous ultralight backpacking tents, and also bigger cabin tents, are non-freestanding. Question: Do I have to stake my tent down? Answer: If you want to ensure that your tent is stable and stays in place, then you will definitely want to use stakes for support. A staked tent will have more adequate protection against winds and rain and will help keep the tent in place instead of blowing it away. Question: Can I put a ground cloth in the tent? Answer: No. A ground cloth in the tent will not protect the bottom of the tent from rips or holes. Ground cloths are typically used when backpacking and camping and are placed underneath the tent. However, these cloths can become very expensive and may not even keep moisture from entering the tent and will not do much to protect the bottom of the tent when it is set up. Question: Exactly what is a single wall tent? Answer: Traditional dual wall tents vent moisture due to windows and breathable nylon roof and wall vents. Solitary wall tents are constructed of a single wall of fabric and are usually waterproof and breathable and are often found with mountaineering tents. Question: Can I pack the tent when it’s wet? Answer: If you are hiking, you will see times when you will need to pack it damp. Set it up and dry it as quickly as possible. It is never a good idea to store the tent while damp because it can become damaged and collect mold and mildew. Question: Can I waterproof my tent with a silicone spray? Answer: It all depends on your own preference. Silicone could be used to improve the water-resistant protection of the tent; however, it can’t be used as a main water-resistant coating. A newly purchased tent features polyester or nylon that has what is known as Durable Water Repellency or DWR. This is used in order of the specific threads of the tent. It is separate from the urethane covering on the lower of the fabric. Under certain conditions (winter, higher humidity, etc.) condensation can form within the confines of your tent. Condensation is due to water vapor from your breath, perspiration, or even from wet clothes you may have hung up inside of the tent. To help prevent this, you will want to find a tent that offers proper air circulation and ventilation. 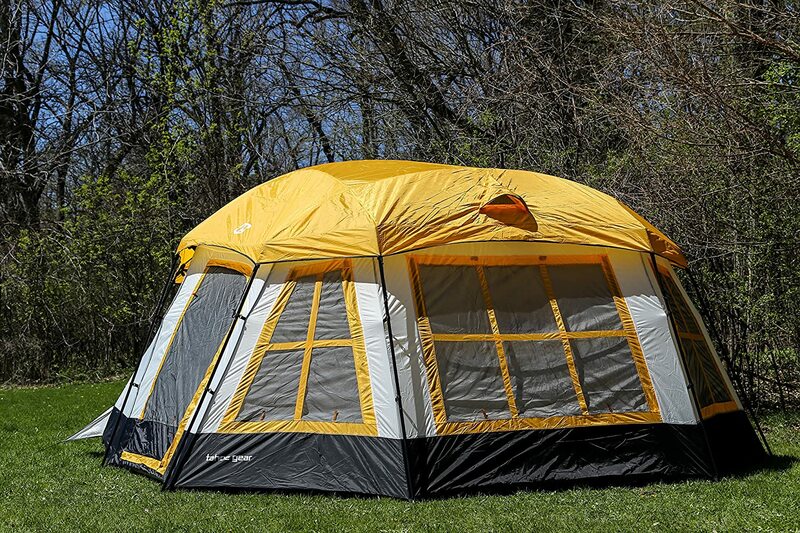 Tree limbs, bird droppings, and even moisture steadily leaking off tree branches could cause damage to the tent. The damage could affect certain tent materials as well as the tent’s outer coating which can ultimately lead to leaks or reduced flame-resistant properties. Never store a wet tent! You always have to dry and brush off caked dirt thoroughly. It is also recommended that you store the stakes or poles within your tent. Work with a separate storage handbag. Stakes must be eliminated by tugging on the stake by itself. Never pull on the tent to eliminate stakes as this could result in personal damage or property damage. Tent poles shouldn’t be left telescoped together during storage space. Do not keep your tent set-up for weeks at a time. Be aware that contact with ultraviolet (UV) rays from sunlight can seriously damage the tent and can also cause discoloration. Affordability: six-person tents are definitely affordable family options, especially when you begin to compare these prices to that of other tents. For example, a ten-person tent will be much larger, and you may find a lot of unused space that you end up paying more for when a six-person tent would have been enough. Space: if your family consists of four to five people, then a six-person tent is a good choice because it offers the space you will need, and you can even utilize dividers for some privacy. Portability: Most six-person tents are lightweight and easily portable. This means that you will have no problem carrying it to your desired camping location. Variety: with so many tent options and styles and designs available, you are sure to find exactly what you need for the kind of camping you plan on doing. Before purchasing the tent, make sure to do some research, read some reviews, and figure out the features you want to have. Finally, make sure it all fits within the desired budget you have in mind.